Campus Aarhus N, the latest campus of VIA University College in Denmark, is officially opened by Her Royal Highness Crown Princess Mary on October 11th 2011. 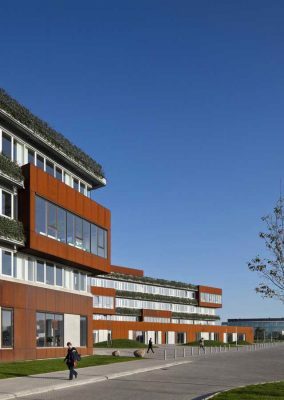 The approx 27,000 m2 building, designed by schmidt hammer lassen architects, unifies VIA’s healthcare educations previously located different places in Aarhus. 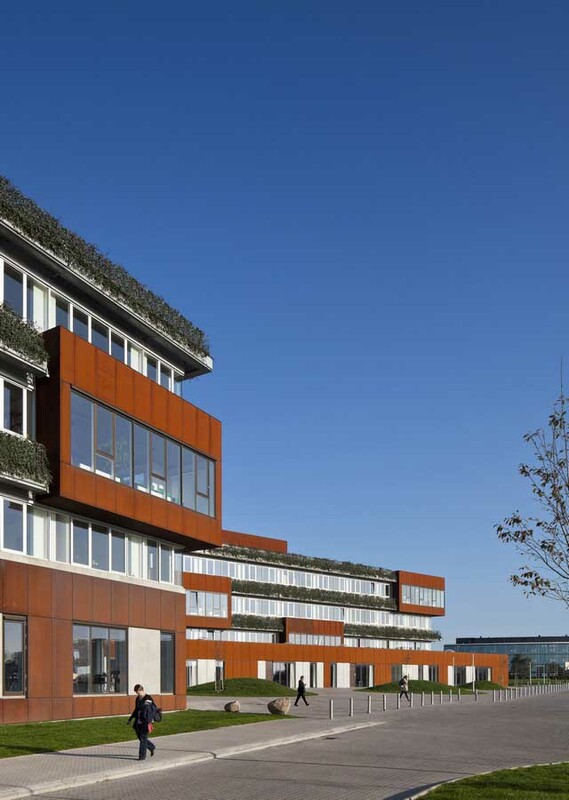 The new campus building offers facilities for the six fields of study that support knowledge sharing and synergy between the educations. 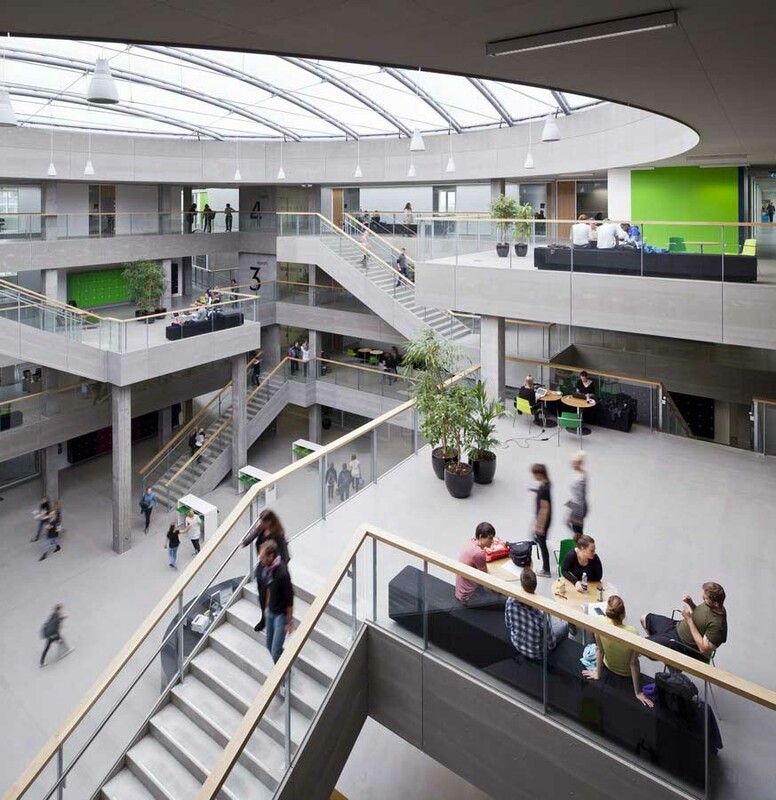 The campus building consists of four wings which centre on a light filled and dynamic atrium – a central square. 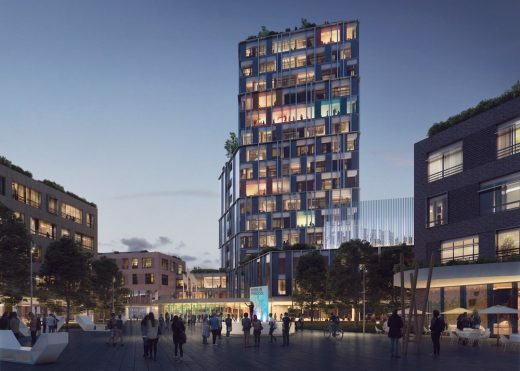 The core functions are placed around the square – auditoriums, a multimedia centre, the canteen, and other shared facilities. 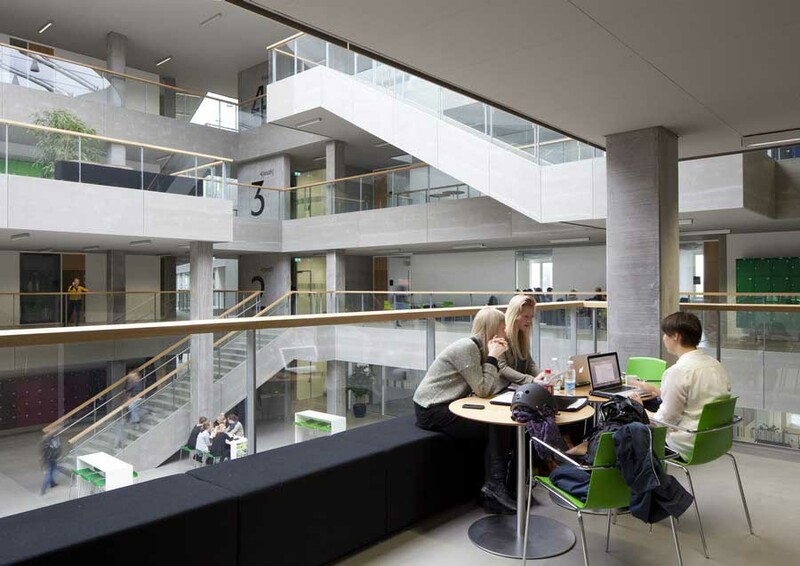 The layout of group rooms, open study spaces, and lounge areas make good use of the spatial diversity in the atrium, thus accommodating the students’ needs for different spatial opportunities to support their learning. Inside as well as outside, the new campus building appears clean-cut and robust, reflecting the ambition for the building to be able to withstand daily use. The concrete of the interior is complemented by a colour scheme unifying the various spaces. “Flakes 2.0” chairs, by shldesign, in similar colours add to the experience of the interior. 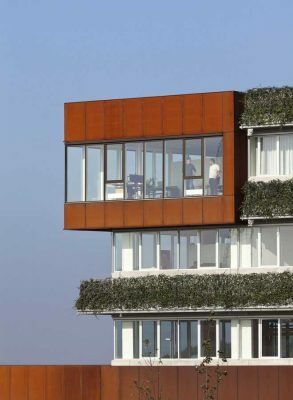 In the exterior the robustness is shown in the strong, rusty-red corten steel frames which form a beautiful contrast to the evergreen band of ivy in the façade elements, designed especially for this building. The green band of the façade integrates the building in the surrounding landscape, and emphasizes Campus Aarhus N as a building that is alive and growing. 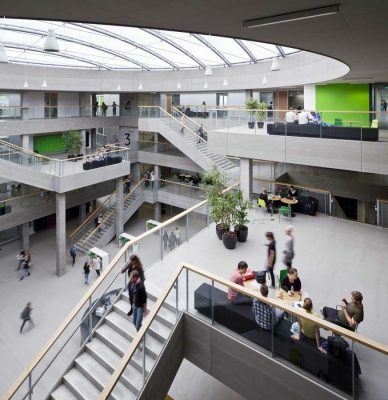 schmidt hammer lassen architects has previous experience designing large educational buildings where the architecture supports knowledge sharing and gives inspiration to new ways of teaching and learning. One example is the Thor Heyerdahl College in Larvik, Norway, which unifies a number of youth educations in one compact building. Another example is City of Westminster College in London, England, which provides much more open learning spaces than typical colleges in the UK. 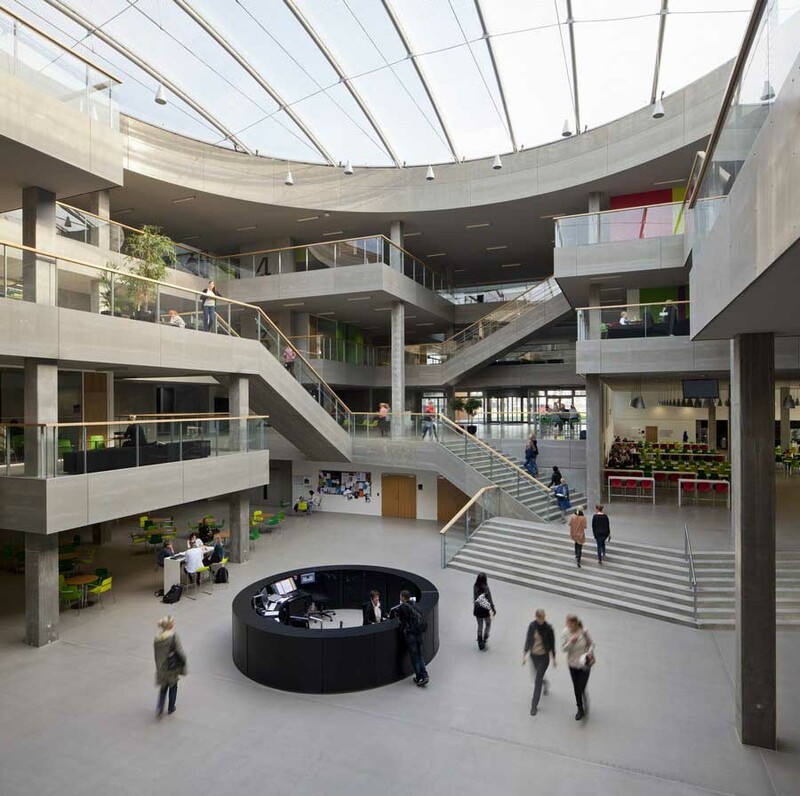 City of Westminster College was opened in January 2011, and has won both the prestigious RIBA Award and a New London Award in the Learning category.